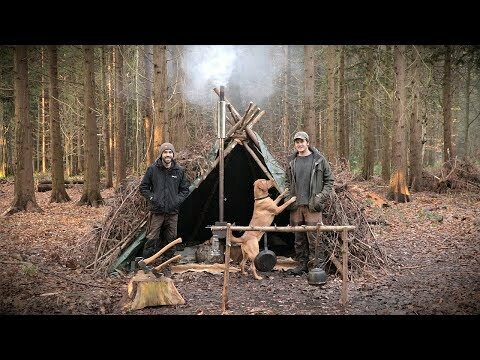 Join me on a 2 day bushcraft camp with Dustin and his Dog. We build a tipi shelter, cook on a woodstove and sleep on deer hides with a wool blanket. We make a large tipi tarp shelter and use debris on top to keep the shelter warm and wind resistant. We then do some camp craft, build a pot hanger and open fire. At night we cook sea food on the woodstove and use the axe to chop firewood. Dustin shows some basic bushcraft skills and shows you some recipes for cooking on a woodstove. The next morning we make coffee and cook up breakfast on the open camp fire. Come and join us on this adventure! They are offering my subscribers 15% off their stoves and accessories on their website: https://www.gstove.com/ The code is “taoutdoors” and they ship worldwide. Landrover camper van wet weekend in the woods. August 23, 2018 Comments Off on Landrover camper van wet weekend in the woods.